BluepointLondon, which has operated the Source London network since September 2014, says it’s ready to add 1,000 additional charge points across the Capital as the number of charges per month doubles. 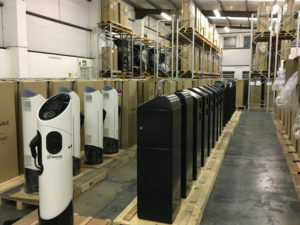 BluepointLondon has 1,000 charge points ready to install in London. The company now has agreements with 20 London boroughs to install charge points following an agreement signed with Tower Hamlets just before the end of 2017 and says it’s only spent £25m of its £100m budget to install charge points in London. BluepointLondon data also reinforces the need for a more comprehensive network of charge points. The number of monthly charges through the Source London network in 2017 more than doubled over the course of year – from 2,885 to 5,822 and reaching a high of 6,271 prior to the festive slowdown. In total, the network recorded just under 50,000 cycles for the year.